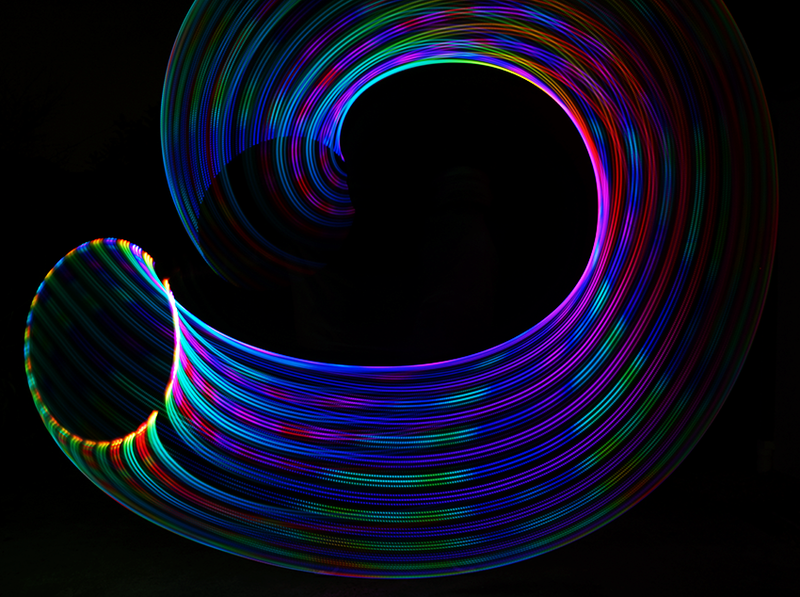 Hyperion hoops are currently shipping in 1-3 business days. Discounts are available for matched pairs! Use coupon code TWINS for $100 off your twins order. Twins receive one accessory pack per pair. For larger multiples, contact us for options. Layaway payment plans are available, and PayPal Credit offers 6-month, same as cash payment plans. See our payment options page for details. We offer the Hyperion in sizes from 22" to 40" inner diameter (ID), in HDPE and clear or colored polypro. See our hoop size and material guide for more information on selecting a size and tubing material. 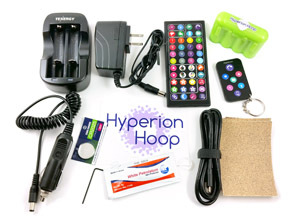 Each Hyperion hoop comes with one free downsizing, which can be claimed at any time. Unless requested, the Hyperion is not counterbalanced. This means that the side with the battery is slightly heavier. 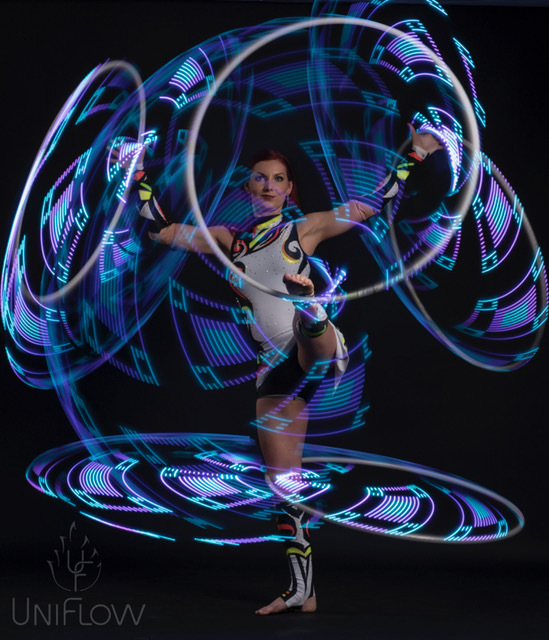 Without counterweights added, the Hyperion is the lightest 3/4" smart hoop on the market and is better balanced than any other smart hoop with a removable battery. The free counterbalance option is ideal for users who prefer an evenly balanced hoop, and adds only 1.9 ounces to the hoop's weight. Many users find that the counterbalance makes tricks like palm spins easier. The counterbalance can be added or removed later if you change your mind. Every hoop or pair of twins comes with an accessory kit. 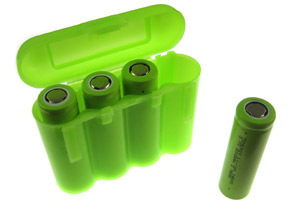 The kit includes a 2-slot battery charger with wall adapter and car adapter, four batteries with case, two remotes (44-key and 7-key), hoop manual, micro-USB cable, extra remote battery, sandpaper, and a few maintenance items. Unless you need an international charging adapter, you won't need to purchase any additional accessories to get started with your hoop! The standard wall adapter works with North American outlets. For other regions, a multi-country adapter is available here. We now offer two options for wireless connectivity: Bluetooth and WiFi. 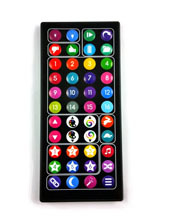 Bluetooth has been standard in the Hyperion since its introduction and can be used to sync two hoops or to connect to the Android app. The WiFi version can be used to sync many hoops and poi at the same time, and it supports Art-Net for wireless DMX control. Bluetooth hoops can't sync with WiFi hoops and vice versa. The WiFi version is still under development and its browser-based interface is not as complete as the Android app yet, but it's the recommended option for anyone syncing more than two hoops or poi, or for choreographed performances that need live wireless control and integration with lighting control systems. WiFi hoops can also be controlled by iPhones and other iOS devices, as well as any desktop with a modern browser, while the Bluetooth version is limited to Android only. The WiFi version has slightly shorter battery life when the WiFi connection is in use. If you're using more than two hoops together, or if you need iOS support, we recommend the WiFi version. If you need to sync with an existing Bluetooth hoop or plan to use the Android app, you'll want the Bluetooth version.